Service techs interact with more than water, chemicals and equipment — they must work with human customers. It’s rare that a pool or spa owner understands the nuances of maintenance, so it’s largely the tech’s job to not only solve a problem but also explain the situation and update customers. The key is to offer enough information without talking over their heads or showing condescension. Follow these tips for a constructive conversation. You may know the root of a service problem the second you see it, but sometimes it pays to let a customer talk. People want to feel heard, and listening to their story might help gain details about the issue or, if nothing else, how best to interact with that client. But if a customer feels ignored or dismissed, that changes their perception of your service. Chances are good that your customer won’t understand industry terms. They may not even know a pump from a filter. People can become confused or intimidated if instructions are too complex. Humans also digest information in different ways. Some want more information than others, says Steve White, owner of Underwater Pool Masters Inc. in West Boylston, Mass. For those seeking an in-depth explanation or tutorial, offer it. And be kind to those who don’t know about the pool, he advises. Ultimately, a customer wants to know what you’ve done or what they need to do. “We try and document everything we do at the pool in the easiest language possible,” says Howard Weiss, general manager of Gaithersburg, Md.-based Contemporary Watercrafters. Comparisons also can help. For example, Rebecca Smith uses the systems in the body to describe how the pump and filter function. The president/CEO of Dallas, Ga.-based Splash Pool Management compares the pump to the heart, the piping to the arteries and veins, and the filter to the kidneys and liver. She says this helps her customers better understand. When explaining things customers must remember to do themselves, visual aids can help. To outline simple tasks, Mike Peacock, owner of Atlanta-based CES Services, puts together a spa maintenance sheet. It’s one page, front and back, and it tells the customer what chemicals they need and how to use them. Explain what you can do and let a customer know when something is outside of your experience or realm of expertise. Don’t be afraid to say things such as, “You need an electrician for this repair,” and then explain why an electrician is more qualified for that job. Most people understand once you show your decision is based on their safety and satisfaction. If you can give a referral, that makes things even easier for them. If you get the customer the help they need, says White, they will be grateful and you will keep a client. Thorough records can be a huge benefit, to you and your clients. In the digital age, there are plenty of ways to document what was done during a service call and pass that on to the homeowner. Some software allows techs to take notes on the site and email a summary to the client, says Tamara Saylor, service manager at Browning Pools and Spa in Germantown, Md. Using a tablet or laptop is easier to read and looks more professional than a handwritten note. Browning plans to go completely mobile in the near future, with iPads and notes that go right to a client’s inbox. Customers are paying for a service, so they want to know you’ve been there. They may also be watching, warns Weiss: Some of his customers have backyard cameras that record the tech’s activity. Techs don’t always want to go into a lot of detail, but some customers want more information than “fixed pump.” To accommodate both, Contemporary Watercrafters has prepared notes in its system that techs can choose from. They can customize, add and delete what they need, depending on the job details. There are about 20 in the system, covering topics ranging from opening and closing to pump repair, Weiss says. Being there when a customer needs you goes a long way, whether it’s taking the extra time to explain something or responding to a call quickly. People appreciate when you go the extra mile. “I’ll have a customer take a picture of the spa and send it to me to let me know what’s going on,” Peacock says. It saves them money on a service call, and frees his time to go out on calls for customers who have major repair issues. Your customer may not be able to find the right words to explain an issue. This can be a pain point, especially when they’re frustrated and don’t know the correct terms to help you understand what’s wrong. It will help you and the client to ask the right questions in order to get the answers you need. ⚫ What’s the most important thing I can do for you today? ⚫ What’s the problem you’ve had? ⚫ How long has this been an issue? It’s also important to know how your customer wants to receive communication. Howard Weiss, general manager of Gaithersburg, Md.-based Contemporary Watercrafters, recommends asking these questions to avoid misunderstandings or missed communication. ⚫ Who is the primary contact in the household? ⚫ Should information only go to one person or multiple people? ⚫ Do you prefer home phone calls, email, cell phone calls or text messages? Pool plaster does an excellent job of creating a watertight seal for an in-ground swimming pool. Choosing the right plaster finish for your pool can make all the difference in terms of durability, functionality, and maintenance. A good plaster coat may last for as long as 20 years before re-plastering is required because it is a durable surface that can stand up to the harsh environment of pool water chemicals. 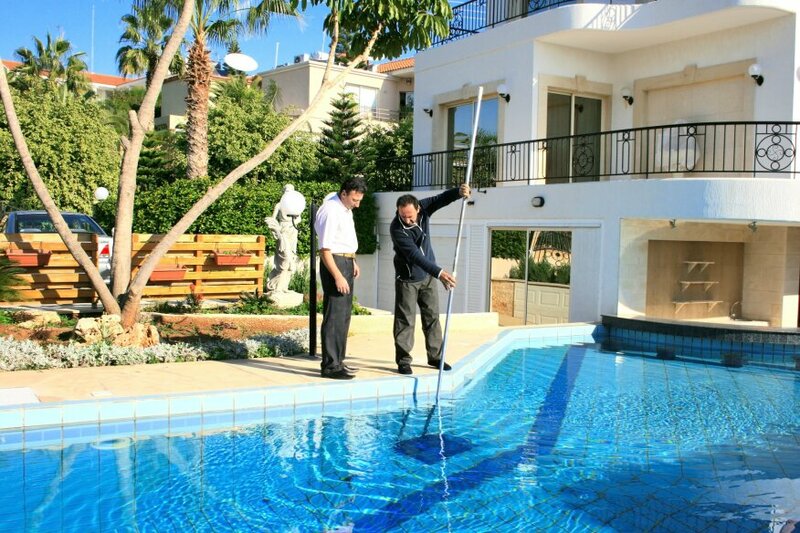 How well can you tell if your pool’s drop in water level is from normal evaporation or a leak? The reality is that some concrete pools will leak because, while they are highly water resistant, but being a porous substance makes them inclined to leaks. This is why any pools component that is worn out, broken, or failing should be attended to immediately upon detection. In order to maintain the integrity and esthetics of the most visible part of a pool a professionally done smooth plaster coating will prevent water from leaking through into the gunite and potentially damaging other components of the pool’s structure. Damages such as stains, streaks, erosion, pitting, mottling, discoloration, hairline cracks, and especially pool water chemistry are often the most common causes of pool plaster damage. There are many benefits that come with having a pool plastering or pool resurfacing job done, and the type of pool plaster finish, how much pool maintenance you are willing to put up with, durability and cost should factor in your decision making. The current condition of your pool and the type of material you decide to use is the biggest factor, it all, however, comes down to the prep work. The following are some important steps when resurfacing a plastered pool which essentially involves the removal of your old pool interior and resurfacing it with a new coating. Drain the pool then chip away the old plaster to expose the granite followed by thorough cleaning the pool. PS: All cracks should be filled evenly to ensure that there aren’t any uneven places on the surface when you later apply the plaster. Wash the pool with a wire brush, then with trisodium phosphate (TSP) followed by a coating with muriatic acid to remove all mineral deposits. The surface can also be sandblasted in order to make it rough, then a bond coat applied. The next step is to resurface it by spreading plaster, which can either be plaster, pebble, quartz, or fiberglass using a plaster swimming pool resurfacing system. When a pool resurfacing job is done professionally, you can expect to enjoy your swimming pool for years to come.